It’s good to read (via The Wellingtonian and Stuff ) that some positive effort is being made to open up a small section of land on the harbour side of Wellington’s incoming motorway. The article doesn’t mention it, but the beach being referred to is, I think, just around the corner from the harbour outlet of Kaiwharawhara Stream. 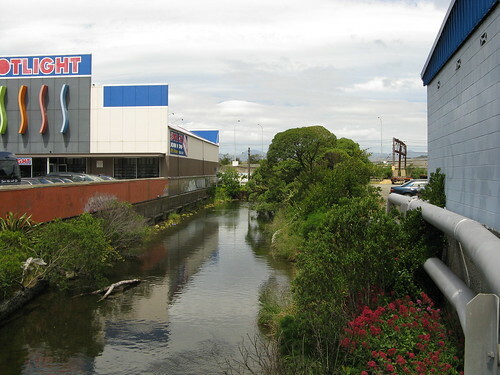 Although it’s public land, this stretch (here’s a map ) has been almost completely cut off from public access thanks to the barrier of 4 lanes of moderate speed regular traffic on the old Hutt Road, 6 lanes of motorway, 4 railway lines, and some Centreport land in the vicinity of the Interislander vehicle loading area on the south-western side. Presently, the only legal way to access the coastal section is from the sea. Several years ago, I made an effort to walk the greater part of the Kaiwharawhara Stream , down from the Karori Wildlife Sanctuary (aka Zealandia ), through Otari Wilton’s bush, a feast of suburbia and Trelissick Park around the Ngaio Gorge. It’s a very nice and relaxed journey which tells a story of history and local ecology. For me, it was rather frustrating to discover that after all this, the entire thing ends behind an ugly and impregnable industrial wall, just before the stream enters the harbour. The stream flows underneath all of this and through a channel between the various commercial/industrial properties, but sadly no provision has been made for any practical form of walking access. If an access way can ever be created so that people can see where the stream finally enters the harbour, it’d make it possible to have a nice sense of closure for the journey.